At COP21 in Paris the parties to the conference witnessed a discussion, perhaps for the first time, on the issue of capacity building that led them to ponder over UNFCCC’s role in this regard. After considerable discussion, Article 11 of the Paris Agreement reaffirmed that capacity building and climate education is essential to effectively implement climate action. Hence the emphasis has now shifted from short term capacity building to long term capacity building. It was further mandated upon the formation of the Paris Committee for Capacity Building (PCCB) at COP22 in Marrakech, Morocco in 2016. During COP22 in Marrakech the Independent University, Bangladesh (IUB) and the University of Cadi Ayyad in Morocco held a side event to discuss the role of Universities in implementing Article 11 of the Paris Committee. Also the Research and Independent NGOs (RINGOs) group, along with IUB and the UNFCCC Secretariat, held another side event on the same topic. 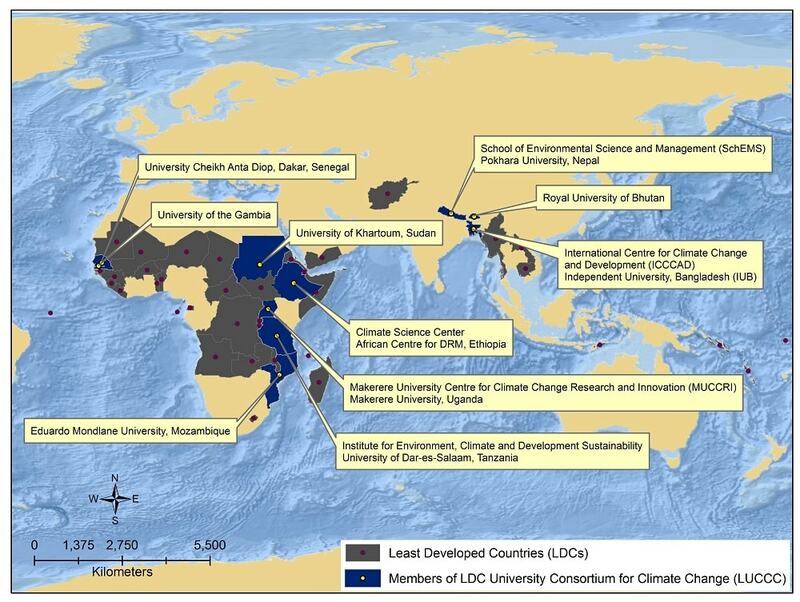 Following an overwhelming support from students and faculties of the universities from the Least Developed Countries (LDCs), ICCCAD and MUCCRI took the initiative to set up the LDC Universities Consortium onClimate Change (LUCCC), a South-South Consortium of 10 Universities from the region to enhance knowledge on climate change through climate capacity building, with a focus on adaptation measures, such as education and research. To foster a South-South collaborative network for enhancing research capacity and proficiency in climate change. The Consortium is initiated by the LDCs and will only include the LDCs. To network and develop the capacity of South-South Consortium of universities to develop common research projects and implement teaching and training programs in different climate change aspects. The focus of the Consortium will be on climate change adaptation, especially community-based adaptation. To work with the most vulnerable communities for the most vulnerable communities. This will be a two way collaborative capacity building program which will offer help to others and will also seek help from others in order to build capacity of their own. To provide capacity-building support to LDC universities to serve as repository. Director, International Centre for Climate Change and Development at Independent University, Bangladesh.